LISTEN TO EPISODE 33 OF MN GHOSTBOX NOW! 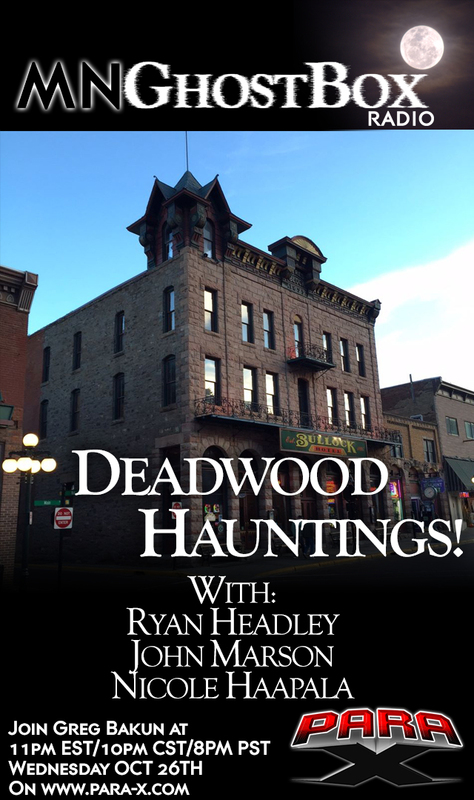 MN GhostBox just returned from Deadwood investigating and my guests will be Ryan Headley & John Marson from the awesome Paranormal group Things That Go Bump MN and our very own Nicole Haapala from MN GhostBox. We all traveled and instigated there together. We are going to talk about what happened to us while we were in Deadwood plus talk a little bit about a fun event that is taking place at the The Palmer House Hotel, Restaurant & Pub in November! The paranormal activity that happened out there was incredible and the stories are amazing. Deadwood if full of so much history that you can’t help but walk down the street to feel it’s energy. Check this episode out!